“Via Crusis” or The Way of the Cross. The story of the long dark hours leading to the crucifixion of our Lord, Jesus, the Messiah. Professor Wayne Campbell’s thoughtful script was a favorite for audiences every Easter at the Scottish Rite Temple in Guthrie for over 50 years. “Via Crusis” is now returning as a production of the Invisible Theatre Company as a Reader’s Theatre. Tim Heaton, Artistic Director of the Invisible Theatre Company has created a thoughtful adaptation for the reading to be performed Friday, April 12, 2019. The 2019 production is the first step for reviving the full presentation to return in 2020 in commemoration of the 75th Anniversary of the first performance in 1945. The production is not long, but nevertheless requires a 15 minute intermission in the performance. The readers will be placed in the orchestra pit in front of the stage and this will allow the audience to see the beautiful hand-painted backdrops used in “Via Crusis” throughout the production. 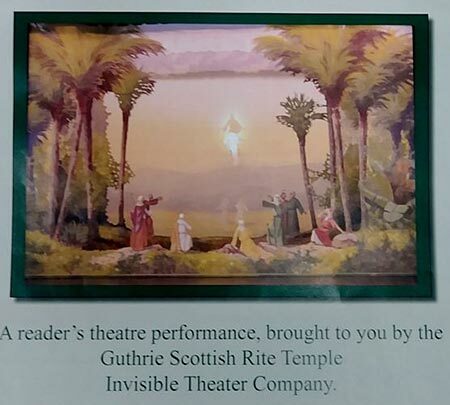 The show opens at 7:00 pm in the main auditorium of the Scottish Rite Temple in Guthrie, Oklahoma. As always, the performance is free of charge, and is a production that every family member can enjoy. The play premiered with playwright Dr. Wayne Campbell directing. The show is for general audiences and there have been many outstanding women in the productions. Campbell’s protégé at Oklahoma City University, Marianna Davenport, became an integral part of the cast. She assumed the role of director for many years upon her mentor’s retirement. During that time I became an actress in some of the smaller roles. It was thrilling to work with my mentor every year in this Passion Play. Ultimately, another protégé of Davenport, Dr. Jim Tresner, (my husband’s mentor and dear friend) sat in the director’s chair. He honored me by asking me to assistant direct the women’s scenes. I discovered a new actress, Janet Best who then played Mary Magdalene. Best is no stranger to the theatre and, as the sister of Heaton, has performed often in community theatre since that time. This year she will be the mother of Jesus and there is a new Mary Magdalene, Amy Staton. For over fifty years “Via Crusis” was a family tradition. Year upon year many actors performed in the same roles while many others had a number of roles. A few of them have returned; Tim Heaton who directs as well performs is back as well as Jimmy Hartzell and Will Hurd. James Long and Jim Case as well as many other new faces will be joining the cast. They include Rick Staton, Danny Colvert, Ryan Colvert. Also the cast welcomes Heather and Russell Aduddell alongside Michele Heaton. It is fascinating for the three of us to trace the connections we have had with “Via Crusis” throughout our lives, and discussing the familiar story from a more feminine perspective. Heaton was also mentored by Dr. Tresner, and he carries on the traditions that have been passed to him, mentor to protégé and so on over the years. However, there are always new perspectives and ideas that make this show unique and this sheds new life on the story, a story that has been celebrated for over 2000 years and honors the sacrifice of our Saviour, the most important story in our lives. It is a thrill to share it with the public. Best has found that she is able to relate to Mary, Mother of Jesus, as a mother. Since doing Mary Magdalene her experiences in raising her own children have allowed her to understand how the mother of Jesus feels about her child. In her heart he is still as precious as the day he was born in the manger. Staton sees Mary Magdalene as a woman of conviction and unflappability, willing to forge forward, undaunted. She is not afraid to incur the disapproval of those who strongly believe that a mere woman should remain in her place regardless. Staton sees that this is an important component of Mary Magdalene’s relationship with Jesus. “Via Crusis” will be performed the one night only, Friday, April 12, 2019. There is no charge and everyone is welcome for the performance beginning at 7:00 pm. The beautiful Scottish Rite Temple is located at 900 E. Oklahoma Avenue in Guthrie, Oklahoma.